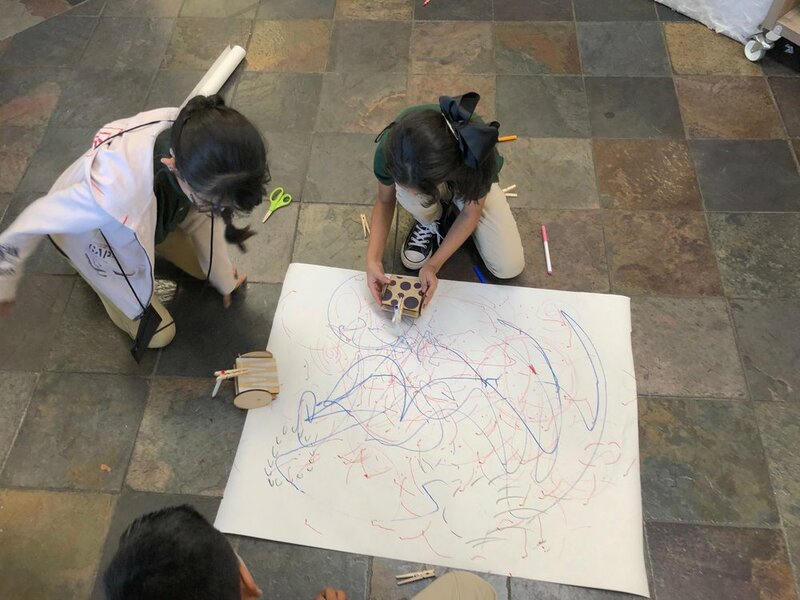 Scrappy Scribblers — Wonderful Idea Co.
We’re continuing experiments with a set of motion board kits, wooden bots with two DAGU motors and interchangable wheel shapes. Over the past few weeks, students and teachers at Lodestar Charter School are collaborating with us to prototype this new activity. After a intense prototyping session at East Bay Maker Faire in October, we are thinking about new designs for the bodies and improved connectors for the wheel hubs. But we also wanted to try an extension to the simple motion boards by adding markers to create a “scribbling machine” set that focuses more on testing out different motions. Before trying the activity with fourth graders, we simply used zip ties to attach clothespins to the front of each motion board. During the quick design feedback sessions, learners could switch out markers to experiment with different patterns. There wasn’t a lot of space to let the motion boards roam freely, so we worked on shared tables and even moved to the floor around giant pieces of paper. Groups quickly noticed how easy it was to make perfect circles with the regular round wheels. Students tried out placing the markers at different heights in the clothespin that changed the motions of the bots and introducing counterweighted movements that caused the pen to bob up and down. Overall, although it was a really fun experiment, I’m not sure how much markers add to the tinkerability of the activity. While color or possibly sound can add something to the activity, we think that it also might distract from investigations of the core phenomena of how the different shaped wheels and the direction of the motors affect the movements of the machines. We’re interested to explore more about how an initial workshop with the basic motion board set could encourages deeper reflection when learners go on to make custom art machines. We’ve noticed that wooden circuit blocks can be a testing ground for circuit layouts with copper tape or conductive thread and in a similar manner the motion boards might be a good low-threshold starting point for explorations of mechanisms and robotics. We’re excited to continue to prototype these low threshold microexhibit ideas with students and eventually share facilitation guides and instructables with the larger maker education community. 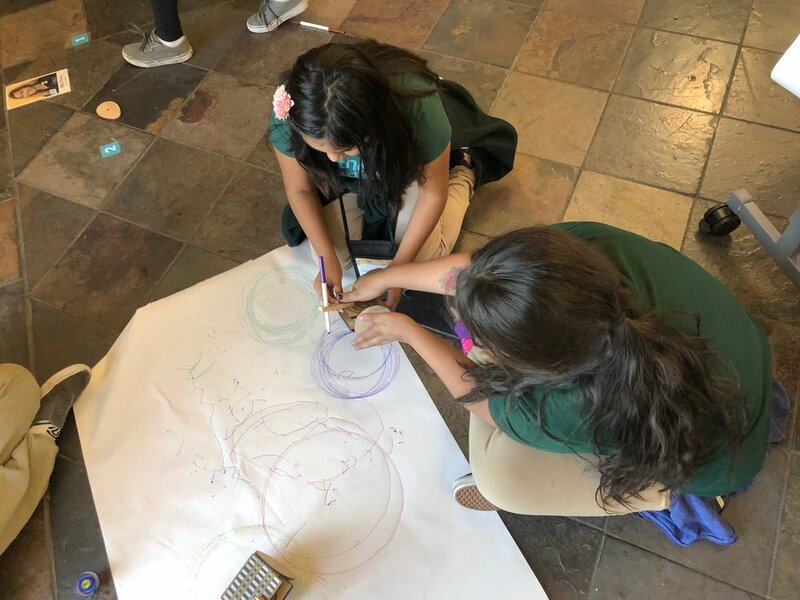 Prototyping time and R&D with Lodestar Charter School students was made possible through the generous support of Cognizant “Making the Future” grant.